I first read about The Connaught at an extremely impressionable age. I was too young – it left an indelible, immovable mark on my consciousness. I was fourteen-years-old, but I remember the sequence of events very clearly. I was staying with my aunt and uncle and I found a book titled Expensive Habits tucked away on a bookshelf. I was drawn to it; I extracted the slim volume and slipped it into my bag. There was something about its elegance – the Bolivar Coronas on the front cover or the handmade Charvet shirts on the back? It was the beginning of the end for me. The author is Peter Mayle and the tone may, in hindsight, be a little ridiculous. Sadly, this copy of the book is long gone, its shabby, broken-down spine and wine-stained pages passed on to a sybarite chef I worked with years ago, so I can’t reference it now, but I plan to buy a copy from Amazon and report back. The book is broken into compact nuggets of luxe that included Cashmere, Truffles, Foie Gras, Cigars, Caviar, Chez l’Ami Louis, The Handmade Shoe and…The Handmade Hotel – The Connaught. Back when Mayle was writing this guide to these vital luxuries of life, the head chef at The Connaught was the famous Michel Bourdain, a bastion of Francophone traditionalism in a rapidly changing London of 1980s. Today’s chef, a gifted Gascon by way of Paris, could also be described as a traditionalist, albeit one with a keen eye for new waves of modernism and innovation. 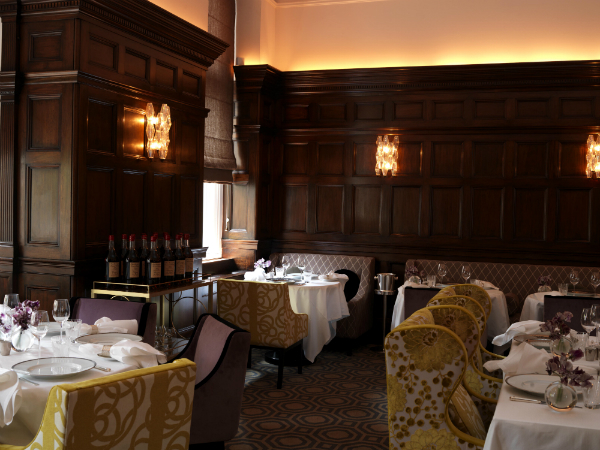 Hélène Darroze took the helm at The Connaught in 2008 but she was no chef de partie at this stage. Darroze had already confirmed her status as one of France’s most driven and talented female chefs, with her Michelin-starred Paris stalwart, Restaurant Hélène Darroze. Five years on and with two hard fought Michelin stars, the London restaurant has confirmed its status as one of London’s most consistently impressive fine dining restaurants. 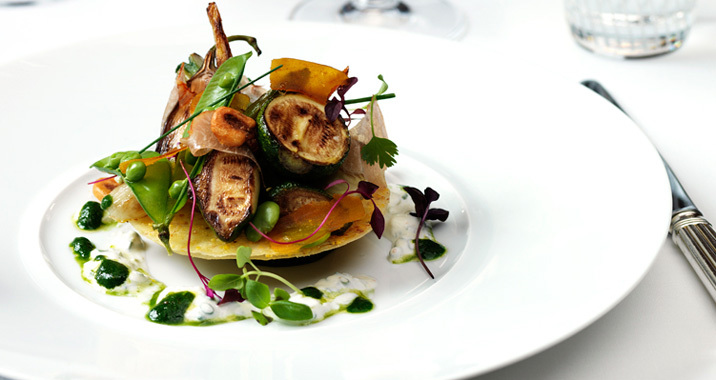 As soon as one arrives at The Connaught, it’s easy to understand how the hotel charmed Peter Mayle so comprehensively. There has been some modernising in recent years, since the hotel became part of the Maybourne Group, but there is still a sense that you are walking into a smart Victorian residence. The beautiful oak staircases, thick mahogany panelling and Old Masters on the walls seem wonderfully intimate, but there is a great sense of theatre in the entrance hall as a mixture of aristocrats, members of the international business elite and assorted London beau monde congregate for an evening’s entertainments. That rare sense of drama is maintained as we make it through to the dining room. I can remember limited occasions where I’ve been served Krug in a restaurant (or anywhere for that matter); this is the first time I’ve ever been served Krug from a jeroboam as an aperitif. The Connaught has a special relationship with this smartest of smart champagne houses, so is able to offer this superb wine in large format for a very reasonable price. 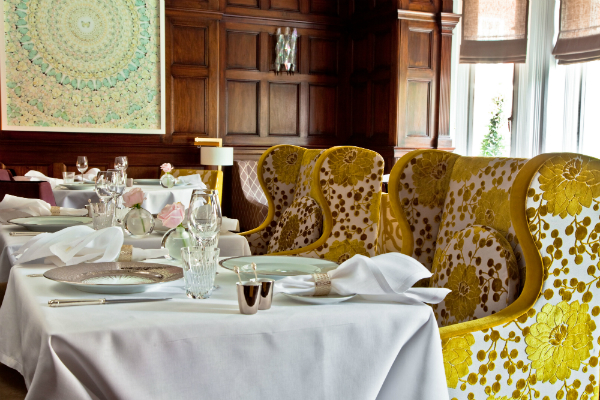 The dining room is classic, but with touches of colour and a sense of exuberance. We have a well-appointed table that looks out over a selection of smart members of the international Establishment, and a wonderful sommelier who takes us for a quick tour of The Connaught’s venerable cellars – a den of vinous wonderment, where magnums of Latour 1961 snuggle up to bottles of d’Yquem 1900, a sight to be savoured. There is a tartare of Fine de Claire oysters with a white bean sauce and oscietra caviar garnish. This is a subtle, precise dish that energises the palate and draws you in, leaving you ready for the layers of delight that threaten to follow. Hélène Darroze hails from the South West of France and is clearly proud of her heritage. A huge, groaning trolley of Armagnac lies in one corner of the restaurant and foie gras is always on the menu. In the context of our tasting menu, the portion we receive seems absurdly generous – a huge slab is served with sweet brioche and mulled Madiran sauce. The sommelier is on flamboyant form and serves us small glasses of mature Riesling from Alsace, which works as an excellent accompaniment to the liver. The two dishes that follow both draw on different culinary traditions and seem far removed from the classism of the first two. There’s an extremely intense black ink risotto with chorizo, lobster and calamari. This dish has a heady, lingering quality, a sexiness, which remains in the mind long after the plates have been cleared. XXL hand harvested scallops are coated in pungent Tandoori spices roasted in butter. It’s a dish that always stays on the Signature menu. 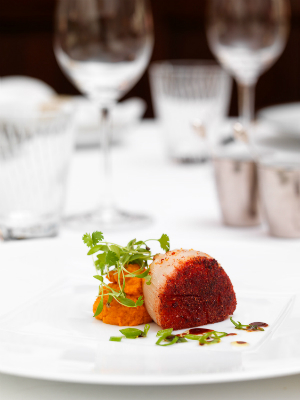 The scallop is vast, firm and enlivened to an inordinate degree by the carefully constructed spice mix. These dishes are wonderful surprises. I was expecting a chef who might hide behind the shirt tails of tradition, but Darroze is clearly an extremely adept innovator. Roast breast of Racan pigeon is probably my dish of the night and brings us back to the classic French tradition. The pigeon is served pink in a sauce of its roasting juices combined with a very delicate mustard. It is gamey, yet composed all at once; there is a strong sense of purity here too: no complex saucing, just the bird’s own fat and blood and a little wine. Speaking of wine, the sommelier’s poured some extraordinary things to accompany these masterpieces. Sancerre Les Montes Damnés, F. Cotat, from the 1993 vintage – when have you ever been offered Sancerre from the early 1990s? This one is exquisitely nutty and evolved. There’s a rich Chassagne-Montrachet, and an opulent white Hermitage. These are some of the most fascinating wines I’ve ever been served in a restaurant. The Sancerre is perhaps the least swanky, but is without doubt the one I’ll remember and is the wine that sets the restaurant apart. We finish the meal with superb, abundant cheeses from affineur Hervé Mons, which soak up the singular qualities of the yellow-gold Sancerre. This is the essence of fine dining in my mind, an experience where you’re overcome by the detail and specificity of an experience. 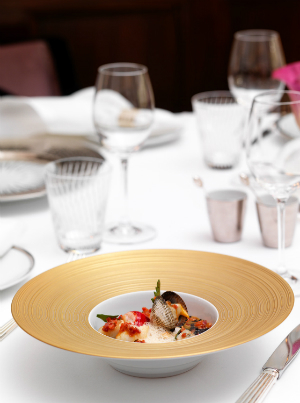 The menu has qualities that are entirely unique to Darroze, details that you won’t find anywhere else in London, or England for that matter, and that’s what makes dining here a thrilling experience. It’s late now, gone twelve and I have a flight in the morning, but the last amber remnants of Armagnac (distilled by Darroze’s father) rest in a glass on the table. I think back to my teenage self, poring over Mayle’s book, drinking in those tales of faraway, elusive luxury. I’m here now, savouring said luxury in all its silky glory and it feels sweeter than I’d ever imagined.